Overall the total city budget of $3,444,825 (city) and $7,549,281 (CMA) was approved in items 5 & 6 above after the public hearing (item 4). All Commissioner were present (Sink, Davis, York & Porter) and voted in favor of the budget with Mayor Sallee presiding. 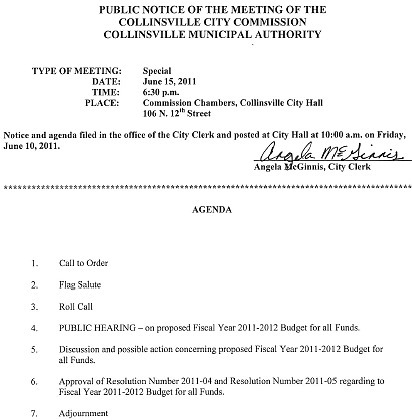 Supporter of Collinsville Downtown Inc. (the Main Street program) made up the majority of the 'public" at the public hearing Wednesday night and were the first topic of discussion. The city budget for the CDI program was raised to $18,000 this year (from $12,000 last year). The state director of the Commerce Department's Main Street program (with 40 communities) spoke of the successes of the Collinsville Main Street program (and a few challenges faced including keeping a local director). A former local program director (Maureen Wright) also spoke as did a few CDI board members. Commissioner Porter commented she "felt better about CDI this year" compared to previous years. Potential equipment to dig Ridgelawn graves without removing existing (nearby/occupied) headstones (if not possible with existing equipment). It was stated that funds for a mini-evacuator are in the new budget with expectation that headstone disturbances would would be reduced but not eliminated. Chamber of Commerce $5K informal request for city funds for promotions activities to be defined later ... not in this budget. Tourism potential -- need better plan for Depot museum joint venture between City and (apparently inactive?) 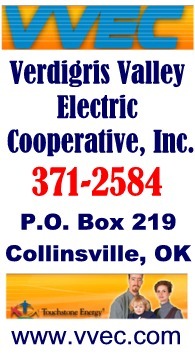 Collinsville Historical society requested with unknown plan/cost. Transition from future 4-lane (after S-Curve project) into 2-lane angle parking in First Baptist block (between 13th & 14th) ... with the question being if additional work in the bock between streetscape projects and s-curve project would be a near-term cost issue 9or hazard) . Quick discussion indicates initial implementation will be narrowed to 2-lanes prior to 14th Street coming from the west via striping despite current construction for 4 lanes. Footnote: There was apparently a commission work session to discuss the pending budget on May31st that I was unaware of until the day after. I requested a budget packet with the numbers reported above (plus a lot more detail) back on June 8th but did not receive it until a few minutes into the public hearing June 15th so I had no numbers to report to the public before the public hearing. -- Ted W.